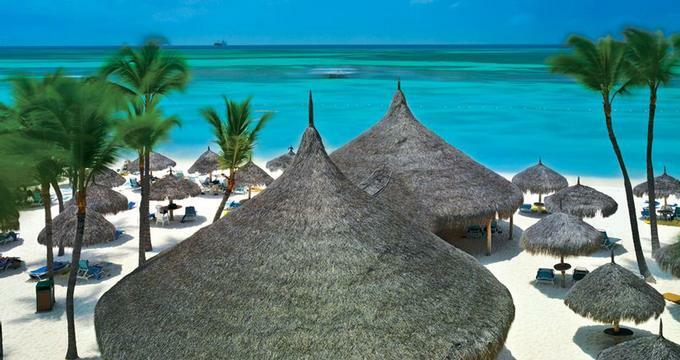 Hyatt Regency Aruba is a 357-room beach getaway in the Dutch Caribbean. The newly renovated rooms and suites offer ocean, pool and garden views. The rooms facing the Caribbean Sea are well worth the extra cost, allowing you to enjoy views of the ocean all day long. ZoiA Spa offers body treatments, massages, skin case and other relaxing services. Stay Fit fitness center lets you shape and get ready for the beach. ZoiA translates to "balance and poise". The spa offers treatments inspired by nature which let you feel rejuvenated and refreshed. Kids and gown-ups will enjoy a tree-level pool with slide and waterfalls. The sandy resort beach offers water sports, tennis and basketball. Younger guests get to participate in daily activities and games and Camp Watapana. Nearby activities include Tierra del Sol Golf Course, horseback riding, ATV tours, Gold Mill Ruins, Arikok Natural Park, Bubali Bird Sanctuary, Museums, shops and historic sights. Tierra del Sol Golf Course was designed by Robert Trent Jones II and is the only 18-hole championship golf course in Aruba. Standard Two Queen Beds : The newly remodeled 380-square-foot rooms are located on the 3rd floor and overlook the resort's gardens and waterfalls. The rooms have a 42" LCD TV, an iHome clock radio and can accommodate up to 4 guests. Regency Club: Breakfast is included, as well as evening hors d'oeuvres and wine. These rooms are situated on the top level of the resort and offer some of the best ocean views. Ocean or Pool View - King Bed: These 380-sq.-ft. rooms offer a private balcony. Options include two Queen Beds, Ocean Front View King and Garden View rooms. Family Suites: These accommodations were designed with families in mind. They have a 50” LCD TV, high-speed internet,and iHome clock radio. They are located on the 5th, 6th, 7th, and 8th Floors. Suites: Several other suite configurations are offered, including Sunset Suites, Cayena, Governors and Trinitaria Suites. Choose from six restaurants, live nightly entertainment, casino and pool bar. Ruinas del Mar: This signature restaurant offers contemporary cuisine in an open-air setting. Sample fresh seafood dishes and steaks, and multiple food stations. Palms Restaurant : The restaurant service authentic island cuisine in a beautiful beachside setting with a view of the open kitchen and the beach. Martinis are prepared tableside. Dishes to try include Blackened Fish Tacos and Seared Sesame Grouper. Balashi Bar And Grill: Enjoy refreshing drinks and snacks at this swim-up pool bar which will lets you enjoy the sun without having to leave the pool. Footprints Beach Grill: This is the perfect spot for a romantic celebration since the exclusive restaurant offers only five tables each evening. Dine with your feet in the sand while listening to the sounds of the sea. You will be served a delicious four-course dinner. Pampered in Paradise : This is a unique dining experience, complete with tiki torches and a romantic setting on the beach. Sunset Service : Have drinks and gourmet hors d'oeuvres in teak Adirondack chairs overlooking the beach. Dinner Sail: Sail along Aruba's scenic coastline in a catamaran operated by Red Sail Sports. A delicious buffet is served during the sail. Sunset sails are great for couples and families. Mexicado: The restaurant service Mexican dishes and handcrafted tequila cocktails. Room Service : Enjoy Room Service 24 hours a day. Casino Bar in Aruba: This beachfront bar serves a selection of exotic drinks, beers and wine. Alfresco Bar : This open-air lobby bar has a modern design and offers views of the water playground and lush gardens. Live music and dancing is offered at night. Palms Beach Bar: The bar serves specialty cocktails, snacks and light meals. Visit at sunset for spectacular views. Piet's Pier Bar: This is another great sunset watching spot. There is Karaoke from 8:00 p.m. - 11:00 p.m. (except Saturdays). Room rates start at $315 per night. The hotel offers packages, deals and specials. The Romance Package includes: breakfast, gift, massage, and a romantic dinner. For longer stays, ask about the 5th night free promotion which is offered during certain times of the year.